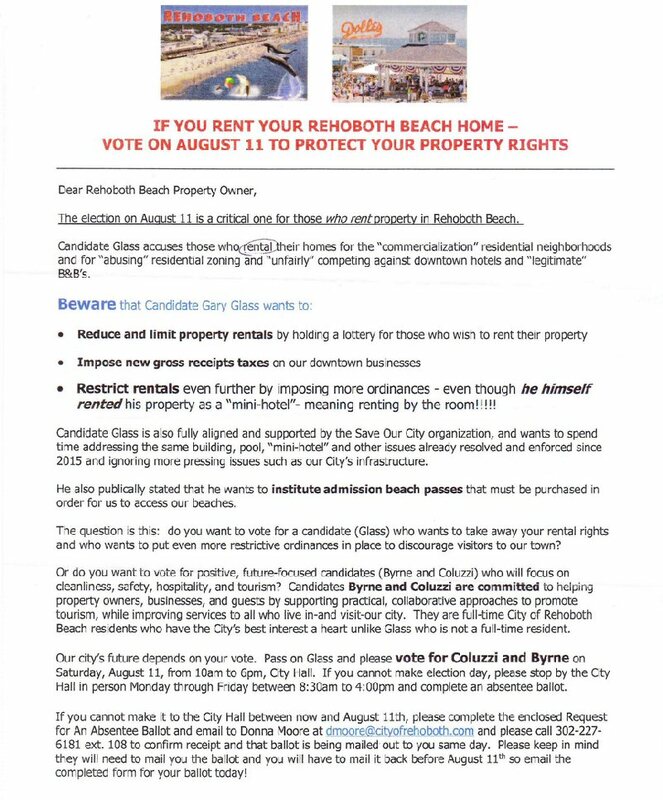 An outraged Gary Glass has been fighting back this past weekend after an anonymous letter was mailed to many Rehoboth Beach registered voters misleading his viewpoints. 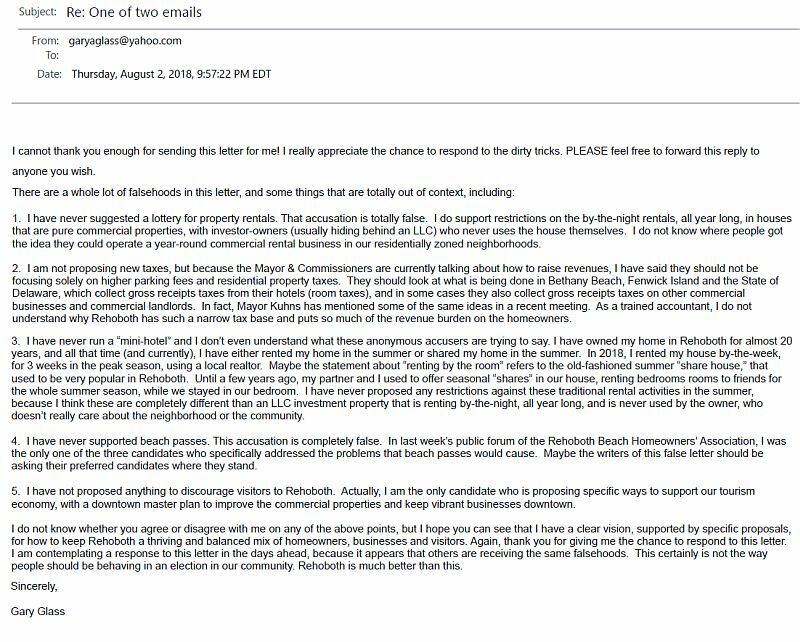 “An illegal, anonymous campaign letter has been mailed to Rehoboth Beach voters, which makes false statements about me and my positions, and which endorses the other two candidates by name,” Glass states. Richard Byrne, Pat Coluzzi and Glass are competing for the two soon-to-be-open commissioner seats in Rehoboth Beach. The election is this coming Saturday, August 11. Glass said immediately after he learned of the letter, he contacted Bo McDowell, the Sussex County Director of the Delaware Department of Elections on Friday, August 3. He noted that he filed a written complaint, which has been sent to the State Commissioner of Elections, Elaine Manlove. Not only is this anonymous letter categorically false, Glass states, it violates the state election laws. He points out that an anonymous letter like this constitutes an illegal election advertisement because it does not comply with the attribution requirement that requires all election material to state who has paid for the advertisement. If the other candidates or their advisors had any role in this mailing or knowledge of it, they must report this to the Commissioner of Elections identifying the person who paid for the mailing and the cost of the mailing as a campaign contribution, he said. Given the expense of a mailing like this, Glass points out, it probably violates the contribution limits. The city has about 1700 registered voters. “If the other candidates and their advisors had no knowledge, then the person who is behind this mailing is violating the law by failing to file a third-party advertisement report with the Commissioner of Elections,” Glass adds. Byrne said this past weekend that he did not know who sent the letter or to whom it was sent. “I personally will not be involved in any negative campaigning or negative comments,” Byrne stated. “It saddens me that an anonymous letter was sent out with such negative campaigning,” says Coluzzi. “This has no place in our community. Candidates should run on their experience, background and record. We are better than that,” she added.